In front of a Buzzfeed video camera, two bizarre figures — one wearing wings and purple scales and another featuring paws, furry hair and upright ears — approached comedian Joanie Quinn. "Oh my gosh," a surprised Quinn reacted. "You guys are, wait, Pokemon?'" Actually, the figures were furries — people who wear flamboyant animal costumes. The video, which has nearly 300,000 YouTube views, features interviews with Quinn and two other Portlanders and was designed to show that the furry community is more than just people in absurd outfits. Though she had never heard of furries, Quinn carried the theme home on the spot, explaining that furries embody the credo that life is best lived when one portrays their authentic self. 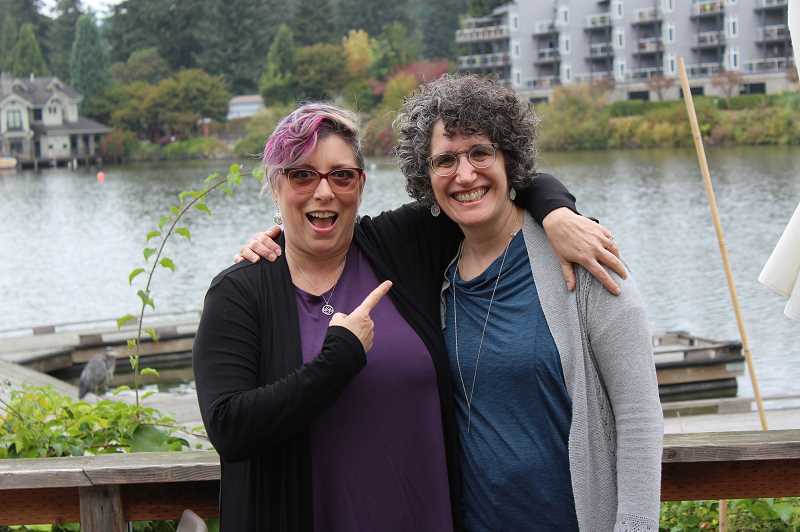 It's a message that hits especially close to home, because Quinn and fellow "Spilt Milk: You'll Laugh 'Till You Cry" co-founder Betsy Kauffman believe that authenticity is also integral to their stand-up comedy show — a show that now calls Lake Oswego home. "I think what I love about watching stand-up, particularly good stand-up, is that people are really mining their own lives for humor," Kauffman says. "They're spending a lot of time writing about their lives and trying to be really honest about where they're at and the kinds of things they're dealing with." "Spilt Milk: You'll Laugh 'Till You Cry" moved from Multnomah Village to the Lake Theater & Cafe this fall and features performances on the second Thursday of every month, including one at 7 p.m. on Oct. 11. It's geared toward adults who prefer PG-13 rather than R-rated comedy and want to meander home early enough to fold laundry before bed. The show boasts a wide variety of comedians, including Quinn and Kauffman, a headliner who performs for 30 minutes and host Wendy Westerwelle. Quinn has been immersed in the comedy world for much of her adult life. She served as a script coordinator for shows like "My Two Dads" and "Dinosaurs," worked with "Two and A Half Men" creator Chuck Lorre and took classes from "The Comedy Bible" writer Judy Carter. Kauffman took up comedy later in life. After hearing Carter teach Internal Revenue Service agents how to develop a routine, she signed up for a comedy class. There, she realized she had a knack for formulating bits and punchlines. Quinn and Kauffman met at "Time Out: The Mother of All Comedy Shows." Once the show ended, they decided to team up. Both say they draw inspiration from their daily lives. Quinn's children, who range in age from pre-teen to young adult, provide ample fodder. Kauffman, on the other hand, discovered a trove of material when her parents moved to Portland. One recent bit involves her mother asking a Verizon employee what happens to her phone contract if she dies. The employee tells her that it is transferred to her heirs, i.e. Kauffman. "I was like, 'Nothing gets you out of a Verizon contract.' My mom was like, 'Sold. My daughter can take care of it,'" Kauffman says. Spilt Milk hosted consistent sell-out crowds at O'Connors Bar and Restaurant in Multnomah Village before it closed earlier this year. Quinn and Kauffman say the closure forced them to implement a change they had been considering for a while. "We had been outgrowing O'Connors for two years," Quinn says. "We had been talking about moving. We have a life going on outside from the show, so it was easier to not jump out of there. The change forced us." Looking for a venue with good food and drinks, a room that isn't too big or too small, parking and a rate that allowed them to pay performers fairly, Quinn and Kauffman scoured the internet. They considered theaters, community centers and other venues and say they found the perfect match in Lake Oswego — the Lake Theater holds up to 90 attendees, compared to about 60 at O'Connors, and Kauffman says they're garnering more interest from comedians than ever before. "This has put us a little more on the map in the comedy community in terms of people not being familiar with us saying we want to be on your stage because it's at the Lake Theater," she says. "It's more of a known venue. And it's so lovely. It's so beautiful." Quinn says comedians generally like performing at Spilt Milk because the audience, which is typically older than at the average comedy show, is more respectful and less inebriated. "That strikes people's interest. The audience is listening. They're not drunk and not falling down," she says. The Spilt Milk founders implore Lake Oswego residents not to hesitate to buy tickets. Spilt Milk's first show in September sold out, and two-thirds of the tickets for the second were gone almost two weeks before the performance. Tickets for shows from October to December are available at www.spiltmilkpdx.com. This year's slate has included Portland's Funniest Comedian winners Alex Falcone and Caitlin Weierhauser (who performed in the September show), 2016 Comedy on Trial winner Sam Miller and other premier comedians in the area. Falcone is the featured comedian at the Oct. 11 show. ing that there was too much cream cheese on a bagel," Kauffman says. "We all have little things like that that happen to us." Along with teaching comedy, Quinn performs stand-up at other venues and events in the area. Kauffman, meanwhile, recently received hearty laughs from Gov. Kate Brown at an event for women Democrats. Kauffman says a particularly important edge to her life would be missing if she decided to act on her occasional impulse to quit comedy and embrace knitting as her primary hobby. And Quinn believes attending a comedy show provides the audience a cathartic release that is difficult to find elsewhere. "It really is amazing how you feel after the show," she says. "We get a lot of feedback like, 'I needed that. I needed to laugh.'" When: Performances are held on the second Thursday of every month, including 7 p.m. on Oct. 11.